This unit is everything I was looking for. It holds page protectors, a ream of paper in the drawer and one in the open space if you like. 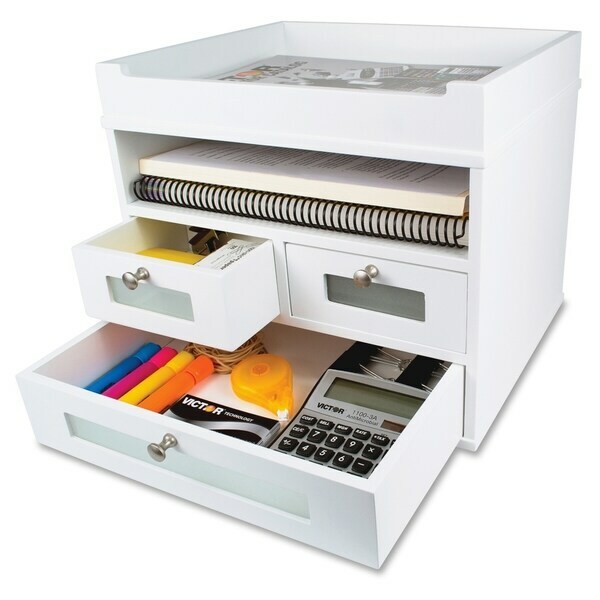 It also holds sticky notes in one drawer, which is full length and can hold a lot of them and the other drawer can hold highlighters, pens and pencils. It is also full length. It looks good and is sturdy. Tidy Tower is part of the Victor Pure White Collection that combines functional solutions with appealing design elements. Ideal for home or the office, this storage tower provides a vertical design that makes the most out of limited space by combining a large letter tray, open shelf and drawers for supplies. A divider inside one of the small drawers offers a space for storing smaller items. Compact tower includes crown molding base; sturdy, 11-3/10 lb. wood construction; and a durable, double-coated, white finish. Brushed metal handles, faux leather top and frosted glass windows add a touch of class. Nonslip rubber feet reduce movement and protect your worksurface from scratches and scuffs. I recently purchased a white desk and wanted the accessories to match. I had a similar tower organizer at my previous place of employment in brown. It was well made and aesthetically pleasing to the eye. It had plenty of storage for sticky notes, staples etc. That's why I chose to order this product based on my past experience with a similar item. Very nice looking and the frosted windows on the draws add a nice touch. Good quality and nice design. It looks great on my desk. "Is the top tray large enough for file folders?" "Please provide dimensions of this product. " This organizer is approximately 13.3 inches high x 15 inches wide x 12.9 inches long.